Write the following functions in a single .py file. Should print out each letter from a-z, along with its UTF-8 value, use one line per character. The function does not need to return anything. Look at the Unicode values from encode_table(), what can you tell about a letter and its rot13 equivalent? Write a function that takes a single character string as a parameter and returns its rot13 equivalent. 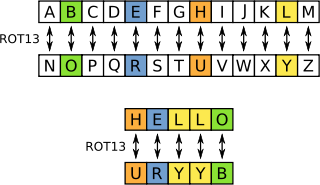 for example rot13char("b") would return "o"
Write a function that prints out all the characters from "a" to "z" along with their rot13 equivalents. Like problem 1, each letter should be on its own line. Write a function that will take a string consisting of lowercase letters only and will return its rot13 equivalent. For example, rot13("skywalker") would return "fxljnyxre"
What happens when you call rot13 on a string that was created by rot13? Go back to the functions you wrote that takes a single character and returns its rot13 equivalent, modify it such that it now works with both upper and lower case letters. Modify your function from part 5 so that it can take a string with any characters in it, but will only modify letters, leaving spaces, numbers and punctuation unchanged.